Maze Rattan Tuscany 6pc 3 Seat Sofa Set: This stunning flat rattan sofa set consists of a 3 seater sofa, 2 armchairs, 2 footstools and a glass top coffee table. This set has a flat rattan weave with a textured feel to it making it most like natural rattan whilst still maintaining the 100% weatherproof qualities of synthetic rattan, the cushions are cream and complement the set beautifully and can be sponge cleaned when required. This stunning sofa set is suitable for all year round use outdoors but could also be used as indoor / conservatory furniture. This set can seat up to 7 people when using the comfortable footstools as additional seating. When not in use the footstools pack away under the coffee table to save on storage space. 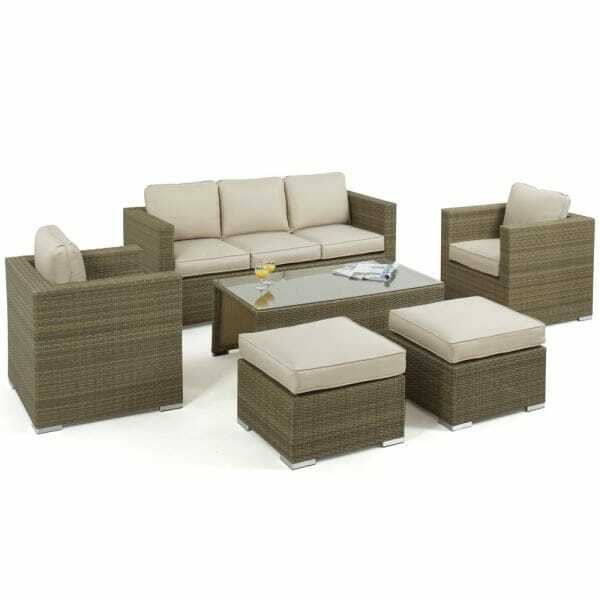 This set will be delivered fully assembled so you will waste no time enjoying the sunshine on your new rattan sofa set. For complete peace of mind this set comes with a 5 year manufacturer’s guarantee.